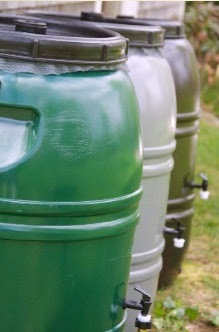 Welcome to Ward 5 Online: Rain Barrels Available for Purchase through the City by April 4th! Rain Barrels Available for Purchase through the City by April 4th! Through a partnership with the Great American Rain Barrel Company in Hyde Park, MA, the City of Somerville is offering rain barrels to Somerville residents at a discount to help conserve water and save money. Barrels can be purchased through by visiting www.greatamericanrainbarrel.com/c-124-somerville.aspx. Somerville residents may purchase the barrels at a discounted cost of $79 (compared to $119 regular retail price). Barrels are available in Forest Green, Earth Brown, or Nantucket Gray. Rain barrels reduce runoff that can harm existing water sources and contribute to overflow in the city’s water system. Additionally, rain barrels can help offset water usage in New England by saving up to 1,700 gallons of water during summer months. Barrels will be available for pick up on Saturday, April 11 from 9 to 11 a.m. at the DPW Yard, 1 Franey Road. All orders must be made by April 4 at 5 p.m.